Capture perspectives as unique as your adventures with the Kodak PIXPRO SP360 Action Camera. 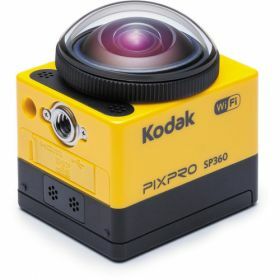 Using a dome-shaped fixed lens with a wide 214° angle of view, the camera records a circular fisheye view of the surroundings, with multiple options available for how that image is 'unfolded' and viewed. Among the viewing options is the fully circular fisheye view, a 360° panorama mode, and a dual front 180° and rear 180° mode that's great for capturing your POV as well as your reactions with a single camera. 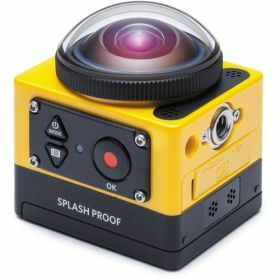 To take advantage of its versatile recording options in a variety of environments, the camera features a compact and rugged design that is 14°F freezeproof, shockproof from falls up to 6.5', dustproof, and splash resistant. 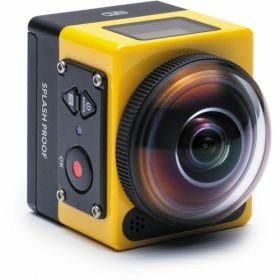 The SP360's 16-Megapixel CMOS sensor lets you capture video in a variety of resolutions and frame rates including 16:9 formats up to 1920x1080 at 30 fps and 1280x720 at 60 fps, 1:1 square formats up to 1440x1440 at 30 fps, and 4:3 formats up to 1280x960 at 50 fps. For slow motion playback, you can record 120 fps at a WVGA (848x480) resolution. The camera also takes still photos at resolutions up to 10-megapixels, with burst mode shooting up to 10 fps so you won't miss that perfect moment. The SP360 is also equipped with a motion sensor setting to automatically trigger video recording when it detects movement. Video and photos are recorded to microSD/SDHC cards up to 32GB in size. The camera also features a built-in 1.0" LCD screen, micro-USB 2.0 port, and micro-HDMI port. When you're ready to share your videos or photos, built-in Wi-Fi and NFC connectivity makes it easy to transfer files to your mobile device, and connect to the free PIXPRO Remote Viewer app foriOS and Android devices. Among it's features, the app lets you toggle between viewing options, start/stop recording, take photos. Included with the camera is a rechargeable lithium-ion battery, Battery charger, USB cable, AC adapter, glass lens cover, protective cover, cleaning cloth, and a carrying case.